A former energy minister has claimed "offshore wind in Scotland is pretty much dead" after a legal challenge against four major projects. A judge upheld RSPB Scotland's challenge to consent for turbines in the Firth of Forth and Firth of Tay. Brian Wilson said the charity now "hold all the cards" over the schemes, which were to include hundreds of turbines. 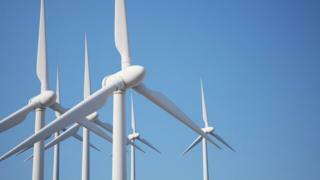 The Scottish government said it remained "committed" to renewable energy but wanted to study the ruling. And Energy Minister Paul Wheelhouse said Mr Wilson's comments were "irresponsible, incorrect and ill-informed". The four projects - Inch Cape, Neart na Gaoithe and Seagreen Alpha and Bravo - were approved by Scottish ministers in October 2014, and could power more than 1.4 million homes. RSPB Scotland lodged a legal challenge, saying the turbines could have "serious implications" for wildlife, and argued that the government had breached legal requirements when making the original decision by not giving proper consideration to this. Judge Lord Stewart ruled in favour of the charity, calling the consents "defective", meaning ministers will have to reconsider the planning decisions and address the points put forward by the RSPB's lawyers. Former Labour MP and UK energy minister Mr Wilson, a longtime critic of the SNP's energy policy, said the legal challenge was an "extremely serious setback". He said: "On the face of it, offshore wind in Scotland is pretty much dead. The RSPB now hold all the cards. "They were forced into this comprehensive action because the Scottish government delayed consent and then clustered these four wind farms together, so the RSPB went to court on the basis of cumulative impact. "What they have to decide is if they want to kill all four schemes or prepare to take a more balanced view, but the ball is in the RSPB's court without a doubt." He said: "They took five years to determine that application. They then delayed it further until after the independence referendum to avoid any controversy, and by that time three other applications had stacked up, and they consented all four together. "If Neart na Gaoithe had been consented separately, then the RSPB probably would not have taken action against it. They could have lived with one, with a kind of balanced policy. "But understandably once they were faced with four they were dealing with something entirely different, with a very large capacity." Mr Wilson also said it was difficult to see how the "damning" ruling could be appealed, as it was "so comprehensively critical". The Scottish government said ministers needed time to study Lord Stewart's extremely detailed ruling before commenting further. Minister for business, innovation and energy Mr Wheelhouse said the government remained "strongly committed" to offshore wind energy in Scotland. He added: "Brian Wilson's comments about the future of offshore wind are, in my view, irresponsible, incorrect and ill-informed. The offshore wind energy sector has a very bright future in Scotland - not least in terms of existing and new projects; most notably with the £2.6bn Beatrice Offshore Wind Farm which has reached financial close and is now being constructed using significant input from the Scottish supply chain. "The Scottish government, the RSPB and renewables developers all recognise the importance of decarbonising our electricity supply and have all made very clear, following Lord Stewart's judgement, that we will work together to ensure delivery of more offshore wind energy projects." RSPB Scotland has insisted that it is "very much supportive" of renewable energy projects in principle, but only in the right form and place. Lloyd Austin, the society's head of conservation policy, told Good Morning Scotland that the group would expect "more effective environmental assessment to be done" if the government moves again for consent. He said: "Renewable energy projects are absolutely needed to address climate change, and the key issue is to get them in the right place, of the right type, and managed in the right way, and to ensure that you have rigorous environmental assessment process to make sure that you do get them in the right place. "It may be that some development in this area is possible, it may be that they need to be in other areas. The question is that the process of determining where developments take place needs to be rigorous and take into account the impact on wildlife." Green MSP Andy Wightman said it was "so frustrating" that ministers had not made the decision in line with the rules. He said: "The framework is in place to make these decisions, and they've failed to make the decision properly. "The burden is on ministers to make these decisions appropriately and follow due process. Had they done so, the RSPB would not have been in a position to take judicial review - or if they had, they would have lost. "It's important that ministers pay close attention to this document, identify where they have failed in their decision-making process and are absolutely clear that they're going to improve that process, and make sure that when they come to a judgement on whether to go ahead with these things that it's a competent one that can stand up in court."